Sit & Go 2.0 - The Next Evolution of Poker at Americas Cardroom! Sit & Go 2.0 – The Next Evolution of Poker! 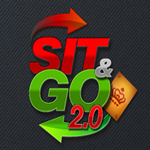 Sit & Go 2.0, a new product concept that promises to be “the next evolution of poker”. The US-facing online poker site has teamed up with renowned Sit & Go professional Collin Moshman and fellow poker coach/author Katie Dozier on the concept. Sit & Go 2.0 will launch in mid-October for free play and in November for real play. While the concept is brand new, Americas Cardroom is not releasing too many details prior to launch to keep the popular item under lock and key. Americas Cardroom has spent the last several months working with the husband-and-wife team of Moshman and Dozier. This will help players familiarize themselves with the Sit & Go 2.0 concept and key strategies needed to succeed. Moshman is a renowned poker author, having written such popular titles. Titles such as “Sit ‘n Go Strategy: Expert Advice for Beating One-Table Poker Tournaments” and “Heads-Up No-Limit Hold’em: Expert Advice for Winning Heads-Up Poker Matches”. Dozier is a popular online poker player who has produced a number of poker videos for DragTheBar.com. On October 17th, Moshman’s Sit & Go 2.0 E-book will be available on Amazon.com. Players can also familiarize themselves with the revolutionary game by watching Dozier live-stream from the tables via Twitch.tv upon the release of Sit & Go 2.0. More details on Sit & Go 2.0 will be released in the next couple of weeks. For information on current Americas Cardroom products like Sit & Crush, The Beast and more, visit AmericasCardroom.eu.